Joint Max® TS by Heartland Veterinary Supply and Pharmacy can help your dog enjoy life again! Safe, Effective, Veterinarian Approved, Joint Max TS offers maximum Joint support-- you'll love the results and so will your dog! Heartland Veterinary Supply and Pharmacy is located in Hastings, Nebraska, USA. Heartland has been in business since 1981 as a functioning veterinary clinic involved with the diagnosis and treatment of health problems in the equine, canine, and feline species. We are America's horse, dog and cat discount supply headquarters and award winning discount cataloger. We carry and supply the information and products you need in order to keep your pet(s) and/or horse(s) healthy. For canine products to prevent heartworms, fleas, skin infections, smelly ears, ear infections, and hot spots as well as antibiotics for infections of infected ears. Dog skin infections can be chronic and we have the pet products to control chronic dog skin infections. We have all the pet products and supplies needed to aid you in preventive care for your pet(s). How Is Heartland Veterinary Supply And Pharmacy Catalog Superior To Other Catalogs? Our motto is “Fast Courteous Service” We are well known for having the best pricing in the industry. “We Will Meet or Beat Any Competitors Pricing”. We have made a reputation for responding to your needs as a horse and/or pet owner. We have a veterinarian on staff to answer questions on products or answer health care questions on horses and pets. 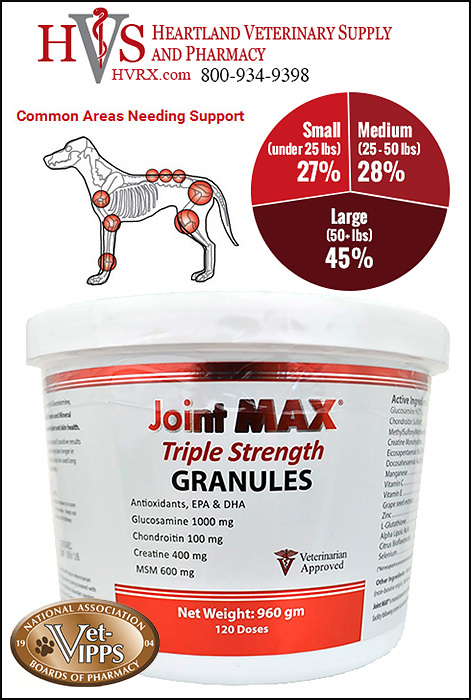 How Can Joint Max® TS (Triple Strength) Help My Dog? Joint Max® TS was formulated by veterinarians who understand what it takes to help stregthen joints and fight pain and inflammation. Joint Max® TS helps combat the stiffness and achiness that occurs when the cartilage between bones breaks down. A powerful Glucosamine, Chondroitin, MSM, Creatine, Antioxidant, Vitamin and Mineral supplement with added EPA and DHA for improved joint and skin health. DIRECTIONS: After 6 weeks, the dosage can be reduced if positive results are seen. Since each pet’s body is different, results may take longer in some pets. Joint MAX® Triple Strength Soft Chews can also be used long term on normal dogs to help keep their joints healthy. Use Joint Max® TS For Your Dog! Your dog is your best friend- and deserves every chance for both a long happy life- and to be as comfortable as possible. Joint Max ® has the right ingredients in all the right dosage, to actually affect the health and well being of your dog's joints! We welcome your phone calls and are happy to assist you with your order. Call us today and tell us about your dogs and we'll help you every step of the way!